The human footprint on our planet has been catastrophic—like the carnage caused by a vast beast rampaging blindly across our landscapes. However, by looking at the effects of this monster on the water cycle, we can identify some empirical means to resolve this destruction. ‘Climate change’ represents a recent recognition of this damage—but wider social and ecological costs are evident through many thousands of years of human intervention on the biosphere, long pre-dating the use of fossil fuels. Our basic needs—energy, food and water (all exploited unsustainably)—now mostly evident only by their scarcity across vast arid areas of the globe; the accumulated result of human excesses over many generations. Consequently, around 60% of the land surface of our normally beautiful blue green planet is now scarred or desertified; still being so by on going human activity, further destroying and degrading our ‘life support system’. It need not be like this; it could be made verdant, much cooler and sustainably productive once again; if only we better manage land and water to reverse wider ecological and economic damage; to allow huge abundance, moderation of global warming and most importantly, space for all. Of all components of global eco-systems, the water cycle has arguably suffered the most, with profound accompanying effects on climate. And, as with all ecocide, much of this degradation caused by exploitative actions for short term gains; with the long term costs ignored, externalised, suppressed or just unaccounted for. Just some of the examples are deforestation; eradication of keystone species that maintain ecosystems; slash and burn or industrial agriculture. It’s to our greater cost and detriment that our species’ awareness extends no further than the collective ‘ends of our noses’. Yet these costs and the measures to resolve and repair can be quantified empirically via the water cycle. Exploitation of the planet’s resources has had some great benefits for a few, but we have reached an economic tipping point. Now, the living standards of the majority in the prosperous Western nations seem to have peaked and are wilting – owing largely to the competitive pressures of globalisation, plus the cumulative effects of the externalised environmental costs. ‘Think global, act local’ runs the well-known ecological saying; but as EU & US living standards peak, an unpleasant side of local self-interest is now arising, currently focused on immigration pressure. Yet this new politics fails to properly consider that the immigration burdens at home are mainly driven by corporate lobbying for this and the cumulative consequences of our exploitive actions overseas. These break down the indigenous economies and cultures of the immigrating peoples – just another example of our externalised ecocide returning to us as socio-economic ‘blowback’. A completely free market is no longer sustainable, nor ever should have been. Planning required here should be primarily based upon climatic, ecological and social gain determinants. Our planet with its growing population has a fixed carrying capacity with restricting ecological factors that require restraint and responsibility. Yet there is little proper corporate or even governmental recognition that we all must live within such finite natural constrictions; which, furthermore, can and should be defined empirically in a wholly non-partisan manner. This is well evidenced in the UK, where half a century of largely unregulated agrochemical farming practice has so degraded soil carbon (humus), and thus also contaminated water aquifers, that the public now have to bear significantly increased costs for flood insurance and water charges. These are both very specific proxy measures that combine economic factors with ecological ones, brought into focus by soil and water cycle mismanagement. Use of agrochemicals destroys soil water retaining and infiltrating properties; land temperatures rise and capillary action in the soil ceases, while chemicals become concentrated in ground water, as rain water runs off much more quickly. In both cases of mismanagement, the less well-off always suffer most. Those forced to live in low cost flood-blighted properties are so often also those unable to afford the inflation-busting charges from water companies; the ever escalating costs of removing agrochemicals from the water supply. Yet society as a whole has also to pay to subsidize all this in many different ways. Just one insight into the true non-wealth producing nature of our present way of life; unnecessary social and economic complexity without logical rationale. In less well-off countries, similar effects of ecocide are often terminally catastrophic for those affected. And often just described as the ‘effects of climate change’; which grossly over simplifies the problem, obscures effective action to resolve the direct causes here, or even address the dire issue of atmospheric greenhouse gases. Myopic governmental policies are often based on flawed, corrupted and incomplete science, or even just wishful thinking. After more than a decade of Nitrate Vulnerable Zones (NVZs) in the UK, 69% have shown no improvement in groundwater nitrate levels, with 31% getting worse – and apparently the government ministry involved has no idea why. Loss of soil carbon has just recently been recognised as a key issue in ‘developed’ nations – but has long been an implicit consideration in traditional agriculture; from the indigenous Terra Preta of pre-Columbian Amazonia to the traditional European methods still maintained by Biodynamic practices. Such ‘Carbon Farming’ now growing in popularity with fresh thinking contributed by a range of other techniques (Permaculture, Mob Grazing, Nature Farming/Effective Microorganisms etc ). Holistic farming strives to consider the entire ecological cycle in its practices, protecting and perpetually building soil fertility and thus also protecting the water cycle. This ‘holistic consideration’ also extends deeply within these practices and their implementation—so different from the prescriptive agrochemical methods that only maintain an illusion of greater productivity either by way of hefty subsidies, or by implicit subsidising of the presently unaccounted ecological consequences. By maintaining or increasing soil carbon, not only the causes but also effects of climate change are moderated. The major processes that enable this are microbial and very sensitive. A combination of management techniques are required to achieve this – the right microbes must be present and enabled to sequestrate atmospheric CO2, thus producing humus and water via the Calvin Cycle. A variety of very strict criteria are involved – the correct nutrients (only composts or other living biological fertilisers; not slurry or midden); the correct plant cultivars that can host the appropriate microbial root activity; the correct cultivation or grazing practices. All only possible by largely avoiding agrochemicals; and therein is the obstacle – the vast inertia of agrochemical corporate lobbying which prevents governmental support of such non-ecocidal agriculture, or even sound empirical science. Avoidance by governmental regulation of even such simple metrics as building soil carbon in our farmland is a shocking deficiency in our struggle with climate change, quite apart from neglecting to protect the public economic interest but it is for the obvious reasons of commercial and landowner vested interests. Most people are uninterested in and disengaged with these issues, yet often still complain about the circumstances they find themselves in. Politicians, either ignorant or corrupted, not just allowing but often actually promoting all this; yet now suffering at the ballot box. The wider public are still mostly unaware of the incomplete science (and worse) that underpins much of their lifestyle, yet voters are suspicious that things are not as they should be. Correctly so, as the degraded economic and ecological systems now in toto only creating wealth for few, while impoverishing the majority. The principle of reciprocity is quite central here; in terms of our actions and how we respect others—who very often might be suffering the consequences of our demands; this might be in terms of the effects of our purchasing decisions; for apparently cheap food or energy, or any other goods. And also quite literally (certainly in terms of water availability and links with soil carbon), ‘reaping the effects of what we have sown’. Ethics and science should be considered together here in resolving ecocide. Nuclear power is spurious in its claimed benefits; a concentrated thermal energy source that warms vast ecologically disruptive quantities of water around its environs, with uranium mining causing an ecocidal legacy of acidic and radioactive water contamination. It’s much the same for other hydrocarbon energy sources—coal, gas and oil, with additional atmospheric CO2 released. Similarly, fracking is another demand on limited water availability, also then dosed with toxic chemicals. The huge intelligence and defence industry costs of meeting our demands of these thermal energy supplies, petrochemicals and minerals are never accounted for in the true comparative costs against renewable energy sources; quite apart from additional costs in human lives, liberties, and well-being. But even now, we are learning the truth, that renewable energy is the cheapest supply over time and socially equalising in its economic benefits; just the same as non-ecocidal agriculture. The social, economic and ecological Beast that we have created can be tamed by global agreement and legislation to end this ecocide. Defining what is—or is not, ecocidal is an important part of this process. 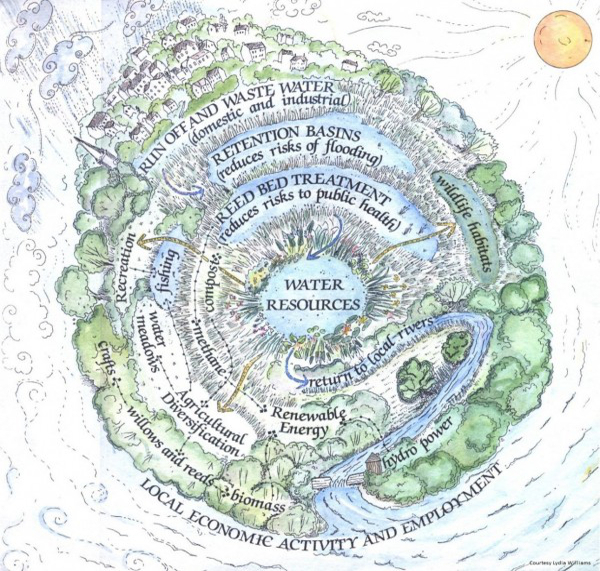 The measures to control ecocide can best determined by the effects of any activity or undertaking on the Water Cycle. These can be clearly and empirically defined in terms of eco-toxicity, soil carbon and water availability benefits, thermal effects, biodiversity, with wider climatic & social gains. This would set a new course for humanity, of abundance and harmony with each other and our environment. Would have liked to hear more about what we can do to improve the water cycle rather than hearing so much about what is being done wrong. Soon the old ways will falter anyway. We need positive stories and inspiring ideas about how we can rapidly regenerate our ecosystems. I know you have some ideas. Where do things like no-till agriculture, pasture-cropping, and planned mob grazing lead us? They lead rapidly to deep rich soils, lush flora, clear-running springs and streams, cooling temperatures, and enhanced rainfall. Thank you for your comment; I agree it is best to be able to promote positive stories and inspiring ideas. This piece was commissioned in this style for another ecological publication and edited by them. It was derived from working within a local process (Agenda 21) to help devise such a positive vision over many years; comprising many reports & films, all voluntary & self funded, mostly by providing bursaries for postgraduate student studies. Several such studies presently ongoing. We made an early film on soil carbon farming in 2009, http://www.water21.org.uk/1551/regeneration-carbon-farming-in-australia/ and another in 2015, http://www.water21.org.uk/2012/dawn-to-dusk-2015/ . In terms of “old ways faltering” not really much of that underway yet. Rather a lot of very effective Greenwash going on … yes we must live in hope and keep working positively on solutions.